Even though the holidays are filled with messages of peace, compassion and care for the weak and vulnerable ones, after the New Year's celebrations people often forget about those who are in trouble and who need our help. There is an ugly and unethical practice, typical for this season, of abandoning animals before going on a holiday trip. There is no more room for the newly arrived animals in the few existing animal shelters, and the number of abandoned animals is increasing with the oncoming ski holidays. Even though this number is lower in winter than during the summer months, it is equally shocking that a family plans their skiing trip without taking care of their companion dog, which used to be a family member and is now left alone in the street. 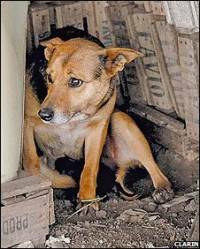 Abadoned animals face many dangers: being run over by a car, dying of hunger and thirst, or freezing to death in low temperatures. We emphasize that abandoning a companion animal is fined with up to 15,000 kuna and invite everyone to report on those who abandon animals, as well as to adopt dogs and cats from animal shelters instead of buying them. We would also like to remind the citizens of the actual legal obligation of microchipping all dogs. Microchipping all dogs will help the guardians of lost dogs to find their companion animals and increase the possibility of sanctioning irresponsible individuals. Animal Friends has repeatedly called upon the local authorities to improve the shameful situation as to the chronic lack of shelters for abandoned animals, or a systematic program of spaying/neutering, adoption, and education. Regarding the fact that four years have passed since the implementation of the Croatian Animal Protection Act and two years since the final deadline before which local communities were supposed to solve the problem of abandoned animals' accommodation and care, Animal Friends will organize a protest on Saturday, January 15, 2011, at 11:00 A.M., in order to demand the constructon of animal shelters and a systematic program of accommodation and adoption of abandoned animals by the local communities, as required by the Animal Protection Act.